Another installment in popular the Assassin’s Creed series, created and developed by the Ubisoft company. Unlike Assassin’s Creed: Unity, released in a similar time window on PC and the eight generation consoles, Rogue is designed for older platforms. 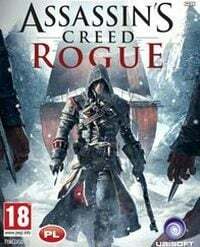 Assassin’s Creed: Rogue for PC, X360 and PS3 is another installment in extremely popular series of action-adventure games created by Ubisoft (creators of Prince of Persia, Rayman, Far Cry and other series). It was developed by studio Ubisoft Sofia in cooperation with Ubisoft’s teams in Singapore, Montreal, Quebec, Chengdu, Milan and Bucharest. Action takes place in the middle of 18th century, during The Seven Year’s War. We play as Shay Patrick Cormac – a Templar who once belonged to Assassin Brotherhood but started hunting for his former “brothers” after he was betrayed. With progression of the story, we are visiting three major regions: New York, Appalachian Mountains and north waters of Atlantic Ocean. The game is final part of the Kenways’ story told previously by Assassin’s Creed III and Assassin’s Creed IV: Black Flag. The gameplay of Assassin’s Creed: Rogue for PC, X360 and PS3 doesn’t have many differences in comparison with previous games of the series. We are completing main and side missions with using protagonist’s unusal skills to climb on buildings and fight. But our enemies have now wider moveset – they are Assassins so they can perform air attacks or use surrounding to hide, among other things. Similarly to Assassin’s Creed IV: Black Flag, the game offers also naval gameplay. Our ship is now Morrigan which is faster than Edward Kenway’s Jackdaw and has more advanced armament (especially the Puckle gun). Assassin’s Creed: Rogue for PC, X360 and PS3 doesn’t offer the multiplayer mode which was present in each game in the series since Assassin’s Creed: Brotherhood (2010). The graphics is on the same level as in previous installment for seventh generation consoles – Assassin’s Creed IV: Black Flag.